Roz Cryer produces both oils on canvas and mixed media paper constructs. 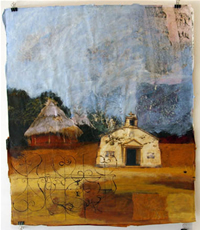 Her background in textile design affects the surface on which she paints. Living on two continents and her training in Transpersonal Psychology guides the imagery and the way these are put together on both paper and the canvas.